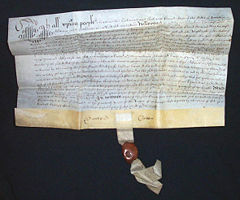 A vellum deed with seal tag dated 1638. Vellum (from the Old French Vélin, for "calfskin") is a sort of processed animal hide that is thin, smooth, durable and was used in the pre-printing age to produce written works in the form of a scroll, codex or book. Vellum originally meant a translucent writing medium made from calfskin, but the term was broadly applied finer quality writing medium made from other animals. Most medieval manuscripts, both illuminated and texts without illumination, were written on vellum. Unlike paper, animal vellum can last more than one thousand years. Religious texts, paintings, and drawings written on vellum during the Middle Ages are still preserved today. Since the introduction of paper, paper vellum, made from plasticized cotton, became popular and animal vellum came to be rarely used. Animal vellum is, however, still used for Jewish scrolls, the Torah in particular, to remind those of the Jewish faith of their ancestors. British Acts of Parliament are also written on vellum for archival purposes. Modern, translucent "paper vellum" is used for a variety of purposes, especially for plans, technical drawings and blueprints. Paper vellum has been standardized from A-size to H-size, and the standard is widely used. Vellum was originally a translucent or opaque material produced from calfskin of an unborn calf that had been soaked, limed, and scudded (a depilatory process), and then dried at normal temperature under tension, usually on a wooden device called a stretching frame. However, except for Jewish use, animal vellum can include hide from any animal, including calfskin, sheepskin, or virtually any other skin obtained from a relatively small animal, e.g., antelope, deer or goat and even a piglet although they are generally too small for the purpose, and equine foals although these are far too valuable as working animals. The terms vellum and parchment became confused early on; according to some sources the former was made from an unsplit calfskin, and consequently had a grain pattern on one side (unless removed by scraping), while the latter was produced from the flesh split of a sheep or goat or other kind of skin, and consequently had no grain pattern. Vellum always denoted the higher quality in any case. The important distinction between vellum (or parchment) and leather is that the former is not processed using tanning. The Mi'raj (also called the "Night Ride") of Mohammed on Buraq. Miniature illustration on vellum from the book Jami' al-Tawarikh (literally "Compendium of Chronicles" but often referred to as The Universal History or History of the World), by Rashid al-Din, published in Tabriz, Persia, 1307 C.E. Now in the collection of the Edinburgh University Library, Scotland. 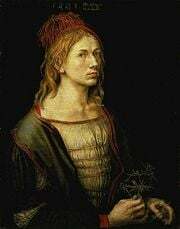 The earliest painted Self-Portrait (1493) by Albrecht Dürer; originally executed in oil on vellum, now transferred to linen. Louvre, Paris. Most of the finer sort of medieval manuscripts, whether illuminated or not, were written on vellum. Some Gandharan Buddhist texts were written on vellum, and all Sifrei Torah (Hebrew: ספר תורה; plural: ספרי תורה, Sifrei Torah) are written on kosher klaf or vellum. A quarter of the 180 copy edition of Johannes Gutenberg's first Bible printed in 1455 with movable type was also printed on vellum, presumably because his market expected this for a high-quality book. Paper soon took over for most book-printing, as it was cheaper and easier to process through a printing-press and bind. In art, vellum was used widely for paintings, especially if they needed to be sent long distances, before canvas became widely used in about 1500, and continued to be used for drawings, and watercolours. Old master prints were sometimes printed on vellum, especially for presentation copies, until at least the seventeenth century. Limp vellum or limp-parchment bindings were used frequently in the sixteenth and seventeenth centuries, and were sometimes gilt but were also often not embellished. In later centuries vellum has been more commonly used like leather, that is, as the covering for stiff board bindings. Vellum can be stained virtually any color but seldom is, as a great part of its beauty and appeal rests in its faint grain and hair markings, as well as its warmth and simplicity. Lasting in excess of 1,000 years—Gregory the Great, Pastoral Care (Troyes, Bibliothèque Municipale, MS 504), for example dates from about 600 and is in excellent condition—animal vellum can be far more durable than paper. For this reason, many important documents have been written on animal vellum, such as diplomas. Indeed, referring to a diploma as a "sheepskin" alludes to the time when diplomas were written on vellum made from animal hides. Another example of a document written on vellum is the Irish bog psalter, discovered in July 2006 in a bog in Ireland, which was written over 1,000 years ago. British Acts of Parliament are still printed on vellum for archival purposes, as are those of the Republic of Ireland. True vellum is still used for Jewish scrolls, of the Torah in particular, for luxury book-binding, memorial books, and for various documents in calligraphy. Today, because of low demand and complicated manufacturing process, animal vellum is expensive and hard to find. A modern imitation is made out of cotton. Known as paper vellum, this material is considerably cheaper than animal vellum and can be found in most art and drafting supply stores. Some brands of writing-paper and other sorts of paper use the term "vellum" merely to suggest quality, when it is actually not vellum. drawing size becomes the height of the next size in the sequence. though other (especially Architectural series) based on a different "base size"
metric (SI) equivalents were used widely outside the US. are usually "black on white" not blue on white or white on blue, but they are still called blueprints. Modern imitation or "paper vellum" is made from plasticized cotton. Usually translucent, paper vellum is often used in applications where tracing is required, such as architectural plans. Like natural vellum, the synthetic is more dimensionally stable than a linen or paper sheet, which is frequently critical in the development of large scaled drawings and plans such as Blueprints. It was also extremely important in that reproduction technology for dissemination of the plans as like a high quality natural vellum, it could be produced in a thin enough sheet to be virtually transparent to strong light enabling a source drawing to be used directly in the reproduction of field-used drawings. During the last century, antedating integrated CAD and modern laser printing which only came about after development of VLSI based microprocessors, synthetic vellums were at the heart of any large engineering or architectural project. "Blueprints" are a copy of such master drawings, and are used as the field and day to day references originally drafted on the vellum masters. Large paper drawings require an additional step (tracing paper amenable to letting light pass through it, and hence is more error prone). Drafting vellums eventually came to be standardized into a series of drawing sizes known as "A-size," "B-size," ..., "G-size" drawings which doubled in sheet size area with every step. Indeed, VLSI microcircuits themselves were laid out on such vellums layer by layer, "masked" to the dimensions of the given layer (a tracing step of sorts), and those masks photographed, all to scale in very large specialty light boxes. The negatives (known as photomicrographs, photo+micro+graph) thus obtained, were then step-reproduced in carefully aligned arrays and etched onto a glass plate Master of that layer. In short huge dimensional drawings representing the guts of an integrated circuit were scaled down optically and reproduced to produce each layer of the computer chips which eventually came to be part of the systems which replaced the vellums that made the CAD technology possible. Large scale hand drafted drawings in today's world are unusual and rare, but the old technology still exists and is the foundation upon which the modern computerized world is built. It is still common for engineers and architects to work out the details of a concept, so called "Sketches" on paper drawings before going to CAD. Even in the heyday of hand drafted blueprint technology technical workers found that working with a sketch was an aid to clear thinking. Vellum is typically stored in a stable environment with constant temperature and 30 percent (+/- five percent) relative humidity. If vellum is stored in an environment with less than 11 percent relative humidity, it becomes fragile, brittle, and susceptible to mechanical stresses; if it is stored in an environment with greater than 40 percent relative humidity, it becomes vulnerable to gelation and to mold or fungus growth. ↑ Online Etymological Dictionary Retrieved July 18, 2008. ↑ BBC report on Parliament's continued use of vellum, BBC, Tuesday, November 2, 1999. Retrieved July 18, 2008. ↑ Frequently Asked Questions about the Houses of the Oireachtas - Tithe an Oireachtais Retrieved July 18, 2008. ↑ Eric F. Hansen and Steve N. Lee, “The Effects of Relative Humidity on Some Physical Properties of Modern Vellum: Implications for the Optimum Relative Humidity for the Display and Storage of Parchment,” The Book and Paper Group Annual (1991). American Institute for Conservation of Historic and Artistic Works. The Book and Paper Group Annual. Washington, D.C.: Book and Paper Group, American Institute for Conservation of Historic and Artistic Works, 1983. Gehring, Stephanie, Ezra Feldman, Ezra Feldman, Stephanie Gehring, and Theo Hummer. Vellum. Ithaca, NY: Soon Productions, 2007. Hegedüs, Celia. Paintings on Vellum. London: Offer Waterman & Co, 2001. Mowery, Frank. Vellum Repair Techniques Using Japanese Paper. S.l. : Guild of Book Workers, 2006. Verheyen, Peter D. Vellum Binding. New York, N.Y.: Guild of Book Workers, 2003. This page was last modified on 19 January 2016, at 21:10.